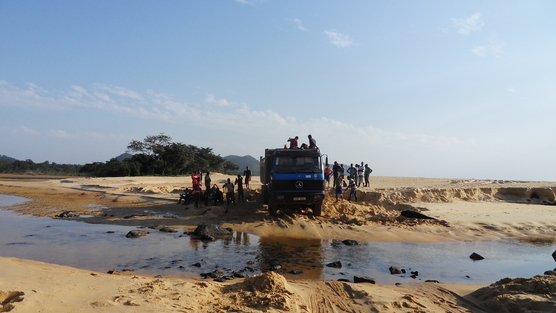 Recently, a Vimeo production entitled “Sand Winning Ghana’s Disappearing Beaches” was posted on the Scrap Short Term Tourist Visas to Ghana Facebook group page. OMG, since May 1, 2013 I’ve been trying to spearhead a campaign to change public policy on visa requirements, getting nowhere fast. And there is nothing illegal about strict, prohibitive, visa regulations! What about sand winning? Now that’s illegal and the campaign against that has been going on for years! In December, 2011, Charity and I went down took guests down to Elmina Bay Resort featured in the sand winning documentary. I blogged about it then. And I signed the Care 2 petition to stop sand winning back then too. 607 other people have signed and no action. OMG, we’ve got a Change.org petition for SCRAP SHORT TERM TOURIST VISAS TO GHANA!And we are up to 160 signatures. Is there any hope for Scrap Short Term Tourist Visas to Ghana when complainants can’t get any action on stopping illegal activity, an illegal activity that causes irreversible damage to the environment? Seems like there’s a Government of Ghana policy to disregard petitions, ugh. Better change strategies…. Well, for one, international attention is a must. Look what happened after West Africa Guardian correspondent Afua Hirsch’s expose of Chinese illegal gold mining here in Ghana (galamsey). The President of Ghana got involved, called for a task force to be formed and then, and only then, was action taken. And, as illustrated above, it also takes top down action, i.e. president down. Note Festus Tumi,my co-administrator of the SCRAP Facebook group page, has just posted a letter addressed to, you guessed it, THE PRESIDENT OF GHANA! Incidentally here’s a coincidence, in August of 2011, a Boston Globe travel writer reviewed Elmina Bay Resort, Four Villages Inn, and the illegal gold mining around Obuasi all in one article! And on a more positive note, congratulations goes out to Chloe Lyme, who made the above Sand Winning Ghana’s Disappearing Beaches. Today, August 16, 2013, Chloe graduated with her masters degree in international journalism! Ayekoo! and one last note, I’m sending this post to the Kofi Annan Foundation. In keeping with what it takes-an international perspective and top down, I’ve sent off a letter to the foundation seeking support for the SCRAP SHORT TERM TOURIST VISAS TO GHANA. More on this in another post.. It will not be easy. Keep walking. Looks like my documentary is getting some attention.